Peterhead manager Jim McInally saw his side slip out of the play-off places following a lacklustre performance at home to Albion Rovers on Saturday. 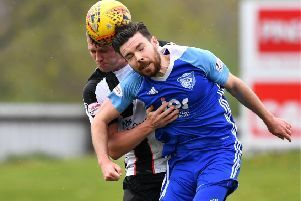 Peterhead could only mange a draw in blustery conditions at Balmoor, leaving fans bewildered at their side’s downturn in form. Peterhead defender, Cammy Kerr, in his first home game since rejoining Peterhead on loan from Dundee, admitted that his side’s performance had been less than impressive. “It took us a while to get going after taking the lead, but Albion equalising just before the break knocked us back,” he said. “We thought we could still go out and get all three points, but we just didn’t create enough chances and although we pushed in the last ten minutes we were not at our best in the match. Speaking after the game, a disappointed McInally said: “The goal before half time was a dampner for us because I thought we could have been two or three up at that stage although we had got away with their breakaway just before they scored. “We huffed and puffed in the second half with the wind at our backs but we never really looked like we were going to get something despite having plenty of corners. “We didn’t move the ball around like we did in the first half but we didn’t do enough in the second half to win it. “We were playing well against the wind in the first half and were passing the ball well but after half time we never looked like scoring and it was disappointing from that aspect. “You have to give credit to Albion Rovers as they did well and counter attacked us as they had come to do but at least unlike last week where we were poor and came away with nothing at least we got a point this week. “You really need to be winning your home games to be where we want to be. “Today was the flattest we have been this season but it has been an ok start to the season. Peterhead next face an away game at Cowdenbeath.